Take the Common Kingfisher, for example, found across Europe, Asia and North Africa. They look great with their blue feathers speckled with even brighter blue. 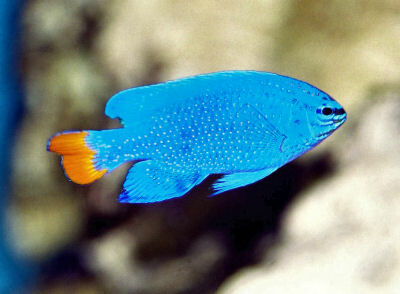 A shock of electric blue on their back and an orange front complete the Hollywood movie look. And where would Hollywood be without stunts and brutal murders? There they are sitting around on some branch, their eyes fixed on a river below them. Even as the branch shakes and sways in the wind, the Kingfisher keeps its head perfectly still while its body wibbles and wobbles all over the place. It's like a guy in a pub tripping on his shoelace and falling to floor, accidentally looking at a big, burly guy's "bird" as he does so, doing more than 30 backflips to escape, changing into the old Spiderman costume to teach the villain a well-deserved lesson, quickly changing back into his civilian clothing, rejoining his friends, secret identity intact and all the while clutching a perfectly level pint of beer in his right hand because that's what really matters. Errr... brutal murders! Of course! 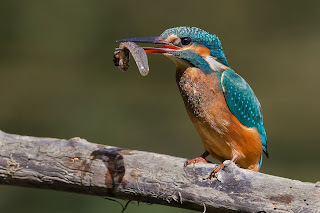 Kingfishers have to eat more than half their bodyweight in innocent fish, aquatic insects and crustaceans per day. So they drop down there and grab 'em, before returning to their perch and beating the fish's head against the branch until it's dead. Kingfishers even have special eyes to help out. They have two areas of particularly precise vision in each eye, called foveae, rather than just the one we have. One of these fovea provides a big field of view but poor depth perception and is used in the air. The other fovea comes into play when the Kingfisher enters the water. It allows both eyes to focus on the same thing, like a bird of prey, so they can accurately react to the panicky escape attempts of fish. This charming salamander is found across the eastern side of southern Canada and northern United States. They reach up to 15 cm (6 in) long and are a nice bluish black colour with lots of blotches all over that would look like a horrible skin disease were they not such a lovely sky-blue colour. So maybe it looks more like a horrible fungus instead. They like moist woods where they can burrow in the soft earth underneath logs and prefer to deposit their eggs in vernal ponds, which are the ones that dry up for part of the year. This might protect them from some of the predators that require longer lasting water bodies. If that doesn't work the adults can thrash their tail while releasing a noxious stench. So long as they don't do that in polite company and blame the guy sitting next to them, they'll be fine. Salamanders of the genus Ambystoma are known as Mole Salamanders, and include old favourites like the Axolotl and Tiger Salamander. But the Blue-spotted is rather more related to some Moles than others. 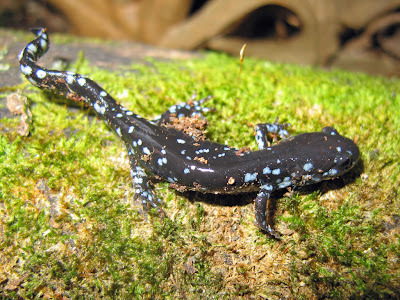 They often hybridize with the Jefferson Salamander, which is a little bigger, browner and with less blue blotches. The hybrids can be anything in between. A really weird thing is "kleptogenesis", klepto meaning "steal" and genesis meaning "origin". There are whole populations of Blue-spotted Salamanders who are entirely female. They mate with other, closely related species but the sperm doesn't actually fertilize the eggs. They need the sperm for egg division to start, but they don't require the actual genes. That's a whole other complication for paternity tests. The Eastern Racer is a 90 to 150 cm (3 to 5 ft) long snake that ranges across the eastern side of the United States, up into Canada and down into Mexico. With such a huge stomping (slithering) ground to play in, there's plenty of room for subspecies to develop. The Blue Racer is one of 11 subspecies, which include Black, Brown and Green ones. Despite being called C. constrictor, they don't actually use constriction to subdue prey. They are, however, racers. These snakes are fast, alert and their large eyes provide great vision. Consequently they prefer open ground to make best use of their assets, although they also climb trees if they have a mind to. 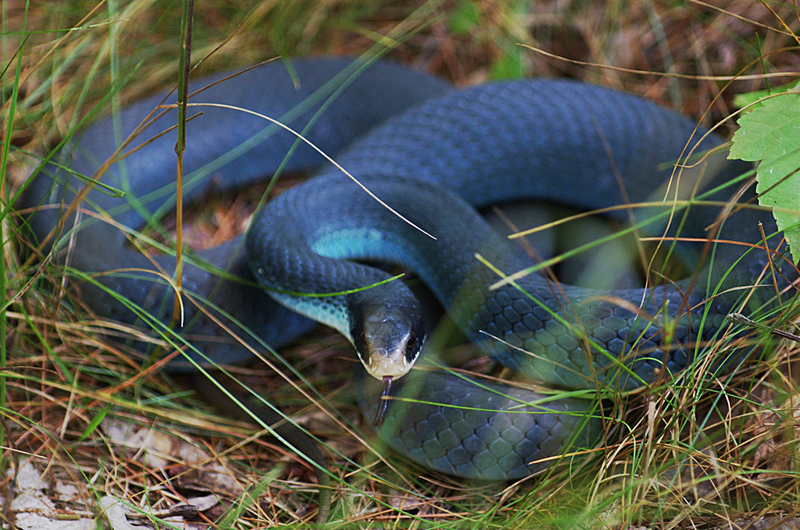 The Blue Racer is found in various states in Midwestern United States. They really don't like people. They keep away from areas with too much human activity and if cornered, they will writhe, bite, defecate and release foul odours until you give in and buy them their He-Man doll or whatever the kids are into these days. Luckily, Eastern Racers are non-venomous and significantly less dangerous than children. The Indigo Milk Cap is a lovely mushroom from parts of North and Central America and Asia. It can reach about 8 cm (2.8 in) tall with a cap up to 15 cm (6 in) across. They live in all sorts of forests and set up trading relations with various trees. Underground, their root-like mycelium grows around tree roots and swap minerals and amino acids for fixed carbon. 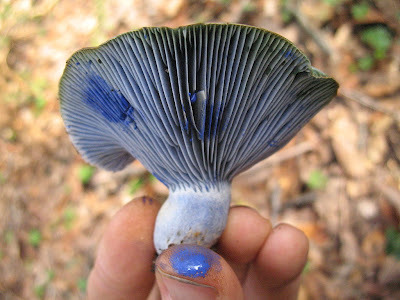 Indigo Milk Caps really are wonderfully blue, especially when young. They get a little more pale and grey as they age; aches and pains, "do you know how many amino acids I had to work from the soil when I was your age? ", that kind of thing. Oddly enough, they also have blue blood! I don't mean they're pale, European aristocrats... actually I don't even mean they have blue blood. 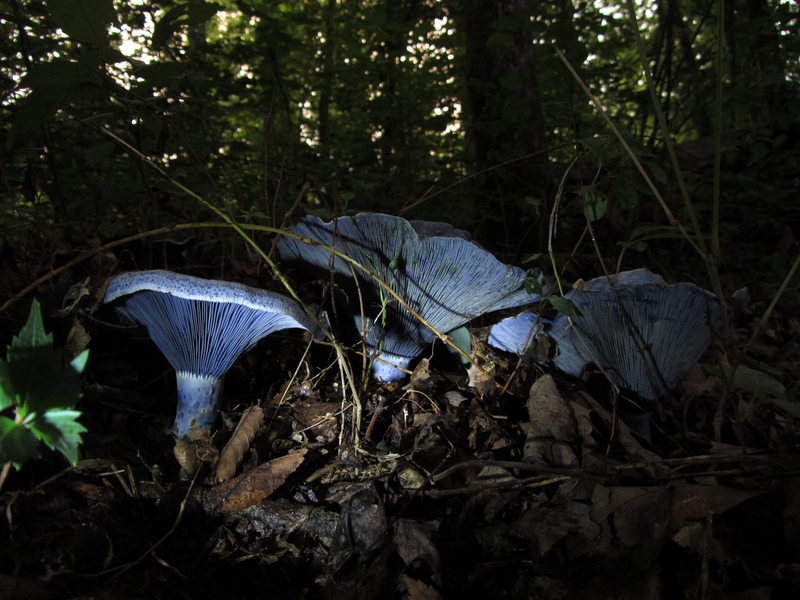 It's called milk, or latex, and it's why Lactarius mushrooms are called Milk Caps in the first place. The stuff turns green with air contact, like if the Incredible Hulk found the ability to breathe utterly infuriating. 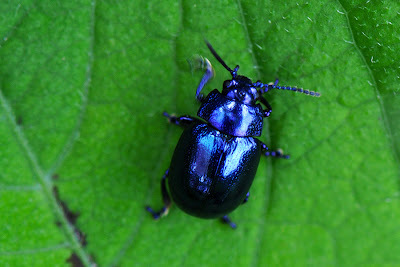 Like many other Leaf Beetles, the Blue Mint is a charming little beetle with an extremely annoying appetite. Like a delightful, funny and entertaining vegetarian at a barbecue. In this case we're looking at a Blue Beetle who loves to eat Mint. Mint, mint mint, every day it's mint. Our mint. The mint WE want. Even the mint we grow specifically for ourselves. They just don't care. Even their young'uns eat mint. And they're in desperate need of minty, fresh breath to compensate for their appalling appearance. These mentholated criminals reach about 7 mm (0.3 in) long and are found across Europe. It seems they have recently settled in Britain, where patriotic mint-lovers are asked to stay vigilant. Here we have a 7 cm (3 in) sea slug who is sometimes misnamed a Nudibranch. Actually it's a Headshield Slug, with a kind of hammerhead that allows them to plough through sand without acquiring a gritty mouthful of the stuff. Like other members of their genus they also have a cool pair of tails which I think makes it look like they're going really fast. It'd be a great, self-powered, bulldozer-bobsleigh thing. Instead, it slowly slimes and slides across shallow, sandy southwest Pacific sea floors. With sensory cilia they follow the mucus trails left by flatworms. When they find their victim, they use their throat like a suction pump and hoover up their prey. It's probably the fastest thing this slug ever does! The Carpathian Mountains draw a huge arc across Central Europe, taking up a lot of space in Romania and Slovakia, and part of Poland and the Ukraine. It's full of those dramatic and picturesque scenes; bridges, villages and old churches forever "nestled" in the grandeur of nature and several castles which may or may not have something to do with Count Dracula. There's also Europe's highest population of bears and wolves. So wander the forests and take in the trees and mountains, the fresh air and wide vistas, ever wary of the teeth and claws which may burst from the shadows at any moment. By all means, grab that pitchfork and join the village folk to burn a guy who may or may not be a vampire. It's all part of the experience. But as you do so, don't forget to take the time to look down and search beneath a log or two. 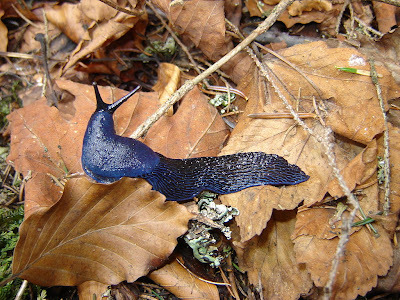 This unique slug is found nowhere else on Earth and it can reach a good 14 cm (5.5 in) long. Half-grown juveniles actually hibernate. Add in the slime and ridiculous amount of time it takes for them to do anything useful and they're just like teenagers! Just a touch more attractive. This little fish reaches about 8 cm (3 in) long and lives among coral in the Indo-Pacific, eating algae and copepods. It's a healthy, balanced diet of tiny things. 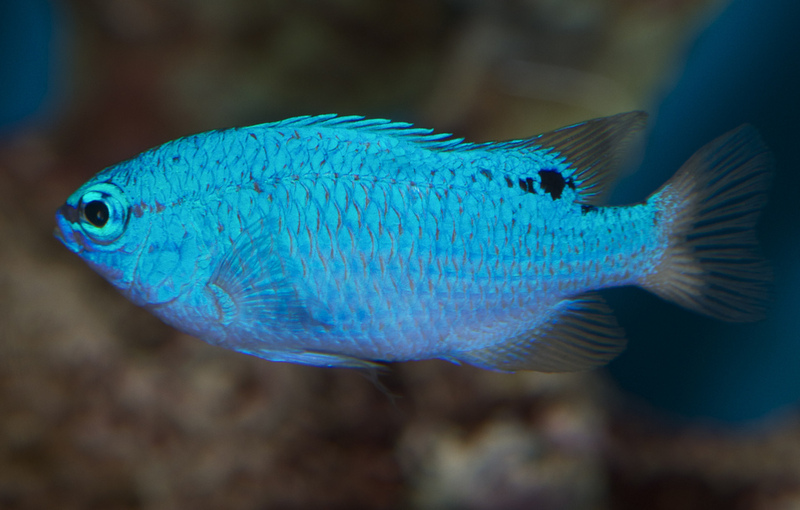 Due to their smallness, hardiness and blueness, these Damselfish have become incredibly popular among fish-keepers. They live well in the aquarium, but can be aggressive and territorial with their own species, smaller species and even fish a little bigger than themselves. When threatened, they can hide in a crevice and turn black to disappear into the shadows! Females like the one here are entirely blue aside from a small, black spot. 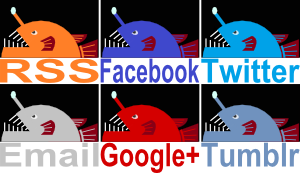 Males have an orange tail, which provides them alternative names like Blue Devilfish and Sapphire Devil. I guess the guys wouldn't like to be called Damsels. Much better to sound like a biker gang. Awwwww! Bobtail Squid are also known as Dumpling Squid and you can see why! I just want to hug 'em and kiss 'em and squeeze 'em! I'll have to be careful, though; females reach just 5 cm (2 in) long, males a little smaller. Bobtail Squid aren't actually squid at all, they're a separate group more closely related to cuttlefish. Most of them are quite small and they come in a whole variety of colours. 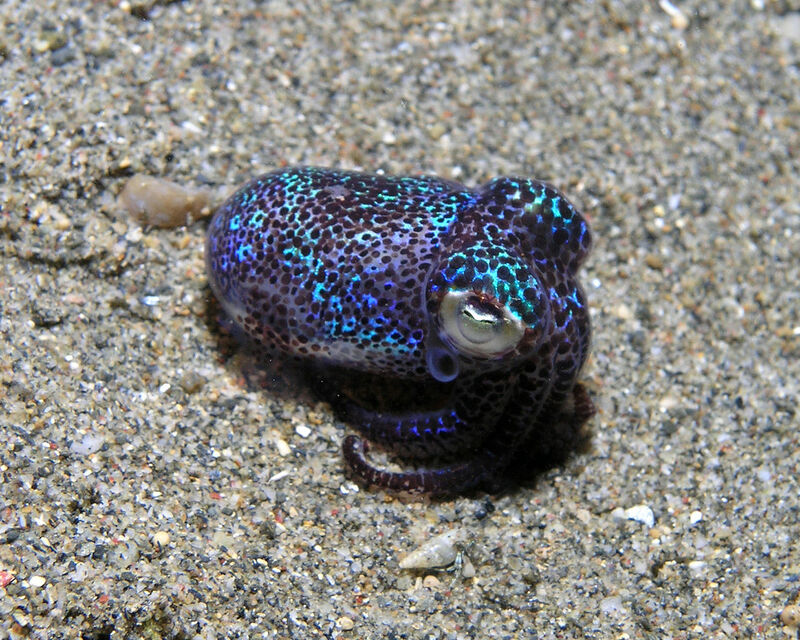 The Hummingbird Bobtail Squid is amazingly iridescent, which might be how it got its name. However, these fellows are extremely concerned with their personal safety. By expanding brown chromatophores on their skin, they can hide their iridescence and camouflage themselves against the sandy sea floor around China and Japan. But it doesn't stop there! They actually bury themselves all day with just their eyes poking out. They even produce a kind of glue from certain glands to make sure all that sand sticks on! At night they look for food. As they swim around, they produce light from an organ on their underside. This masks their shadow against the hazy moonlight, just like a lot of deep sea creatures. Thus hidden, they can descend on bottom-dwelling crustaceans like Death from the Darkness Above. And there I was thinking ninjas always wore black. Oh, I'm sure it's nothing a good ice-cream won't fix! I'm surprised you didn't include the blue-ringed octopus. I know that animal has already been extensively covered on many other sites, but its venom would probably contribute to the sadness of a miserable Blue Monday!